The front-runners clashed in a tech debate last night, but they all sounded basically the same. 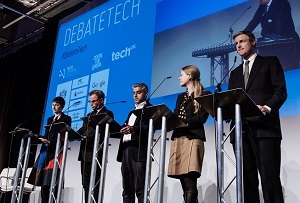 Sadiq Khan, Zac Goldsmith and most of the other major candidates in London’s upcoming mayoral elections locked horns last night in a battle to convince the capital’s technology companies that they had its best interests at hard. Supporting London’s tech industry is a classic piece of motherhood and apple pie. Nobody was going to show up and say they didn’t care about helping start-ups thrive, and there’s very little to choose between them on policy. Almost all made a point of saying superfast broadband needs to be treated more like a proper utility, though details of how were pretty thin on the ground. All backed an idea (proposed by debate organisers Tech London Advocates, the Centre for London and Tech UK) to hire a chief digital officer for City Hall. And all agreed it should be made easier to hire software developers from abroad, though the mayor’s influence on visa rules is slim. It wouldn’t be a debate on London tech if there wasn’t a question about Uber, the controversial taxi app that has had the capital’s black cab drivers up in arms. Wary of coming down hard on either side, most of the candidates were pretty coy in their response, but things don’t look good for Uber. Khan’s response wasn’t exactly glowing either. ‘We’ve got to limit the number of private hire vehicles in London’, he said, citing congestion and environmental issues. The surprise success of the evening came from Green Party candidate Sian Berry. You might not expect business people to mesh well with a political movement that calls for an end to economic growth. But Berry said all the right things on infrastructure, office space and migrant visas – her three years of actually working for a tech start-up paying off in spades. UKIP's Peter Whittle was never going to get a warm reception in front of a crowd of mostly young, cosmopolitan urbanites, but he was at least a good source of amusement. Asked what he would do to deal with poor broadband service in the questioner’s neighbourhood of Rotherhithe he replied, ‘In my own life I just use the phone now all the time,’ before going off on a tangent about business rates. Reassuring. All of the candidates would like to be seen as the tech-friendly candidate, and many are making the right sort of noises. But we’ll have to wait till after the election in May to see if the winner puts their money where their mouth is.